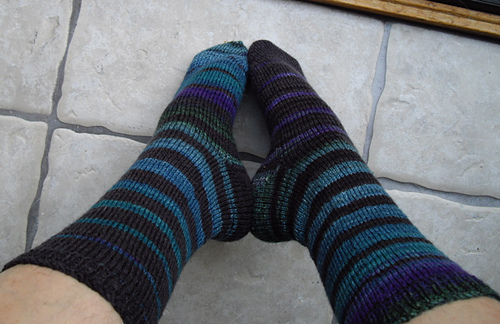 These are stripey socks that match stripily in the ankle area, but are otherwise color-mirrored. They are addictively fun to knit and it is easy to keep track of rounds within the pattern---in fact, it is easy to put down your sock-in-progress at almost any point in the pattern and then pick them up again and see quickly where you are. There are also some convenient pausing points built into the pattern. Sublimation is the process of moving from a solid state to a gaseous state without passing through a liquid state. (It’s what you observe when dry ice creates a mist.) Passing from solid to gas is abrupt, like changing between stripes of different colors. 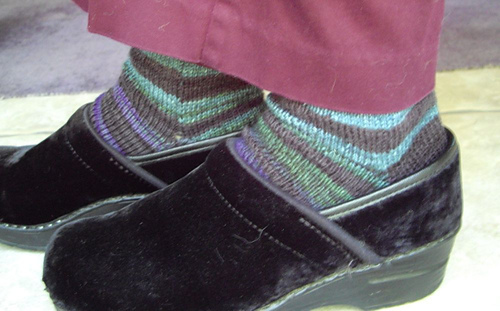 Yet, the effect is continuous, as with the changing of one predominant stripe color to the other in these socks. Any yarn that knits to 8 stitches and 12 rows to the inch will work well for these socks. The pattern is also available for yarn that knits to 7 stitches and 10 rows to the inch (see here) and for yarn that knits to 6 stitches and 8 rows to the inch (see here). The collection of all three versions of the pattern is also available as an eBook (see above), and you can upgrade from a single pattern to the eBook for the difference in price---$3. While instructions are given for toe-up socks, they can easily be modified to be cuff-down. The circumference can be modified easily. The only straightforward lengthwise sizing modification is changing the length of the foot. Size S: foot circumference 7.5”, foot length ~8.5”, total length (toe to cuff) ~13”. Size M: foot circumference 8”, foot length ~9.25”, total length (toe to cuff) ~15”. Size L: foot circumference 9”, foot length ~10.5”, total length (toe to cuff) ~16”. There is a section in the pattern (totally optional reading) that explains the mathematics behind the design. knit, purl, make one, Judy’s Magic Cast On, short rows, Jeny’s Surprisingly Stretchy Bind Off. Links to tutorials are provided in the pattern.